Well, another week down. And what a week it has been. January is almost at a close and, somehow, we are all still alive and not living a real-life version of Fallout (but just in case, might want to get your bottle caps ready). So let's check in with our Twinstiq crew to find out what they have been playing! Scrooloose: Well I finally jumped into the Ashes of Malmouth expansion for Grim Dawn and it's pretty good so far. Two new classes and two full new acts in the game story. I'm more or less planning on that being my major Vice. Yoda and I have decided to install Warframe and try it at some point soon since it's referred to as -Destiny, but good. Plus it's free to play so if we don't like it it's gone and forgotten. And depending on what my schedule looks like, I'll probably keep on with Shadow of War and Horizon Zero Dawn in the wee hours. AJ: DRAGON BALL FIGHTER Z!!! TruLegendKiller: Assassin's Creed Origins has me hooked right now. But I can never stay too far away from Persona 5. About to restart that again because it is so freaking good. Also may make time to play more The Legend of Zelda: Breath of the Wild. GreyWolfe: I'm probably halfway with the Chaot campaign in Etherlords 2. It feels that way, at least. [when I won the original campaign, my guy was approaching level 13. my guy in the current campaign is at about level 8.] - it's fun. I'm glad I'm actually playing through the whole thing, now. As for Book of Unwritten Tales, well, Wilbur's got his robe and wizard hat on, which means it's probably time to move back to Ivo, the elf. I love the design of this game for the most part. All the puzzles are absolutely logical. When you think "geek" you may find yourself thinking of me. From a young age my nose was either plastered in a book or my eyes glued to a video game. 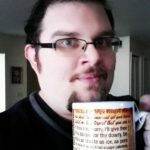 I'll be your guide through all things geeky, from comics to video games. I played around with Battlefront 2 some this weekend. And I managed to beat Lawrence in the Bloodborne DLC, but not Orphan yet. Still gotta hunt down all the old hunter weapons too. I also finally started Demon’s Souls.